Sushma received her B.A. in Environmental Sciences from Barnard College and her Ph.D. from Columbia University. 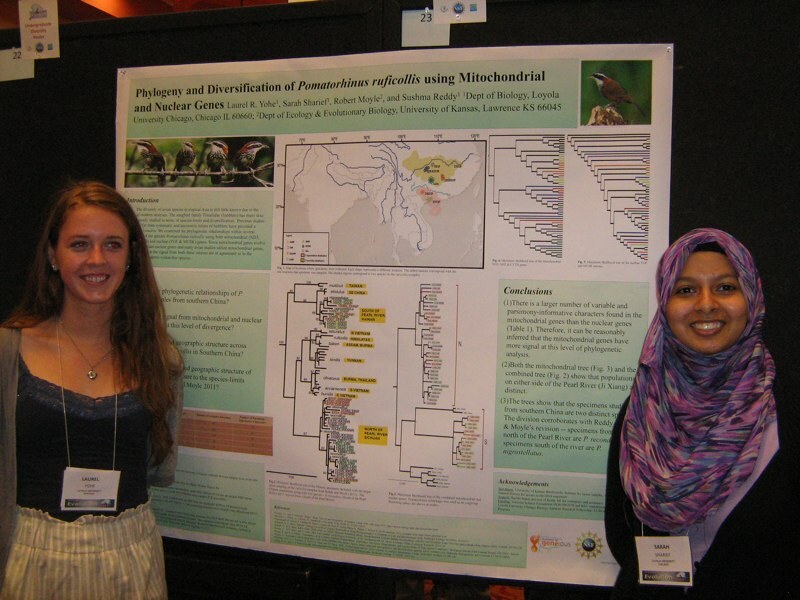 Her doctoral research, the evolution and biogeography of birds in southern Asia, was conducted mainly at the American Museum of Natural History in New York. She spent five years as a postdoctoral fellow at the Field Museum of Natural History in Chicago, working on the tree of life of modern birds. She has been at Loyola University Chicago since August 2009. Jane received her Ph.D. from the University of Tasmania in 2015. For her doctoral research she studied population genetics and phylogeography of Antarctic penguins and seals. In 2016 she spent six months as a postdoctoral fellow at the University of Oxford, working on population genomics of penguins. Jane's research in the Reddy Lab is focused on evolution and biogeography of birds in Madagascar, and morphology and genomics of Antarctic penguins. Heather enrolled in LUC's Biology MS program in 2013. Her thesis project is on the prevalence and diversity of the blood pathogen Leucocytozoon in African birds. She expects to graduate in September before starting her PhD program at the University of Chicago, Committee on Evolutionary Biology. Lynika started her Master's degree at LUC in 2013. Her project is on the phylogenetics and phylogeography of the genus Newtonia, a genus endemic to Madagascar. 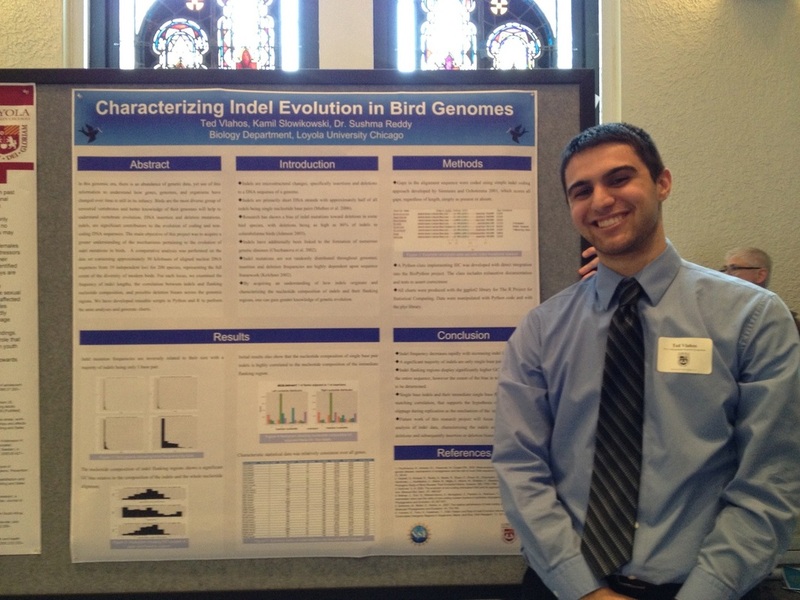 Mustafa Broachwala is a bioinformatics/biology major working on analysis of microRNAs in birds. He is funded by Biology Summer and Mulcahy Fellowships. Sagar Chaudhary is a bioinformatics major working on morphometrics of babblers. He is funded by the Provost and Mulcahy Fellowships. 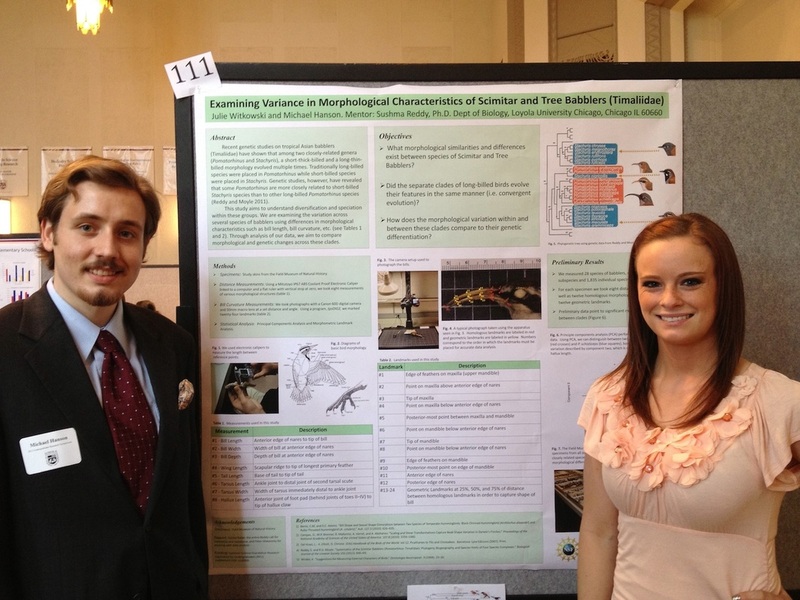 Matthew Bonfitto is a biology major working on morphometrics of Malagasy birds. He is funded by a Provost Fellowship and an REU award from NSF. 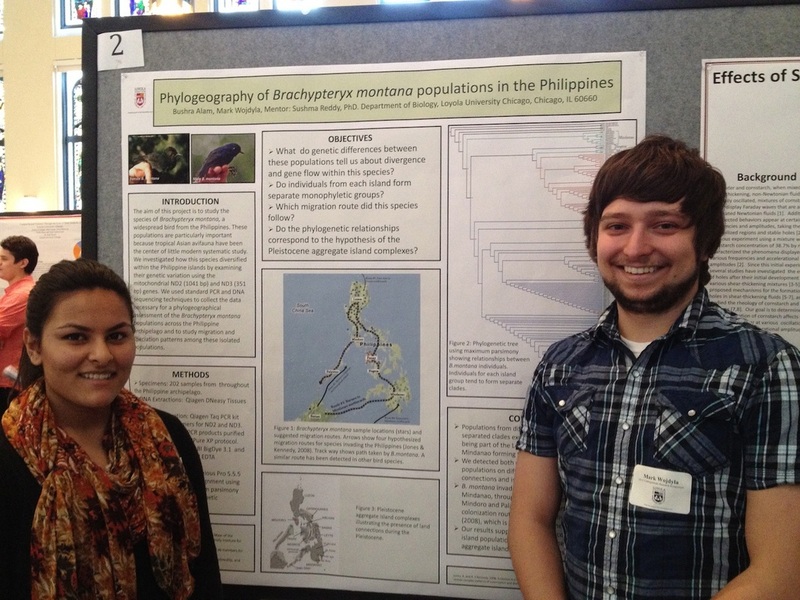 Nicole Gracias is a biology major working on morphometrics of vangas and other Malagasy birds. She is funded by a Biology Summer and Mulcahy Fellowships as well as an REU award from NSF. Emma Highland is a bioinformatics/computer science major working transcriptomes of birds. She is funded by the Provost Fellowship and Computing Research Association (CRA-W) CREU grant. Amanda Misch is a bioinformatics major working on transcriptomes of birds. She is funded by a Computing Research Association (CRA-W) CREU grant. Zuzanna Nowak is a biology major working on morphometrics of vangas.Zuzanna Nowak is a biology major working on morphometrics of vangas.V. V. Robin was a postdoctoral fellow in 2011. He is currently at the National Centre for Biological Sciences (India). Arpi Nyari was a postdoctoral fellow in 2011-2012. He is currently at Oklahoma State University. Sarah Sharief was the first undergraduate in the lab 2009-2010 and later lab technician in 2010-2012. She is now a medical student at Midwestern University. Laurel Yohe was an undergraduate researcher in 2010-2011. She went on to get a Fulbright Research Scholarship to analyze diversity patterns of babblers in Vietnam. She is currently graduate student at Stony Brook University funded through a NSF Graduate Research Fellowship. Zuzanna Nowak was an undergraduate researcher in 2013-2014. Jonathan Lo was an undergraduate researcher in 2013-2014. Rachel Baker was a lab technician in 2009-2010. Michael Hanson was an undergraduate researcher in 2010-2012. He is currently a graduate student at Yale University. Julie Witkowski was an undergraduate researcher in 2011-2012. She is currently a medical student at Rosalind Franklin University. Ted Vlahos was an undergraduate researcher in 2010-2012. He is currently in veterinary school. Kamil Slowikowski was an undergraduate researcher in 2012. He is currently a graduate student at Harvard University. Bushra Alam was an undergraduate researcher in 2011-2012. John Juranek was an undergraduate researcher in 2010-2012. Mark Wojdyla was an undergraduate researcher in 2011-2013. He is currently a medical student at Loyola's Stritch School of Medicine. Billy Zhao was an undergraduate researcher in 2009-2010. He is currently a medical student at Loyola's Stritch School of Medicine.